We got our hands on the latest WWE “High Flyers” Slam Crate from Loot Crate and it came with some fun WWE items! You can currently subscribe to the bi-monthly WWE Slam Crate here and SAVE 10% with discount code MBG! 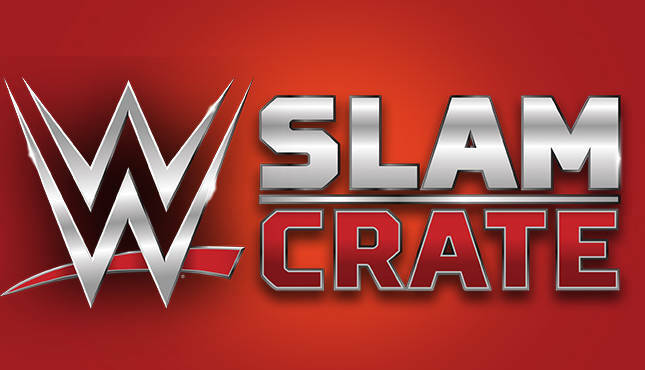 If you’re unfamiliar with the WWE Slam Crate, it’s a subscription box that comes with random WWE themed items, as well as a t-shirt and a WWE Slam Stars action figure! Lately they’ve come with pins of the WWE titles, too. This crate features a “high flyers” t-shirt with a silhouette type design of Rey Mysterio. It has a fun design and the heather-gray color is nice, too. This month’s pin features the Crusierweight Championship title plate. Loot Crate does a great job capturing the detail on these and are great for anyone whom enjoys collecting pins. Every crate has featured one of these lately and they seem to be highly sought after with the current pin craze. Loot Crate had a little play on words with the “Kofi” mug they included. It’s a ceramic cup with pancakes and syrup dripping down. It comes with a rubber lid, making it easy to store and wash, as well as a rubber grip on it that says “Kofi Cup” to celebrate the New Day. Also included is a sleep mask featuring Velveteen Dream’s glasses with a purple fabric. A unique item for any WWE fan that sleeps with a sleep mask and wants to feel classy like the Dream himself! 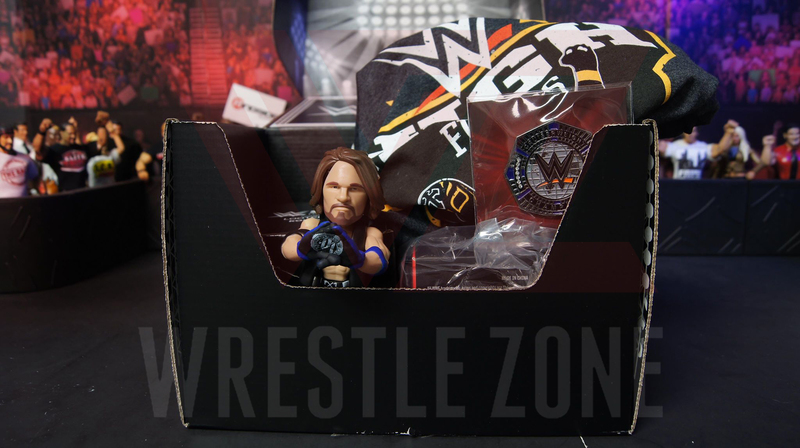 Our favorite part of this crate is the Slam Stars AJ Styles figure. He’s pretty detailed, has some logos on his hands, boots and tights, but is missing his abdomen tattoo with the names and dates of his kids as well as other little designs, which is understandable. You can only pose his head and arms, which is disappointing as he can’t stand that well on his own. You have to maneuver his arms a bit to help him balance as best as you can, unless of course you pose him in the ring piece he comes with. All four figures in this set build a ring like previous sets. The next figure is Chris Jericho, which is Attitude Era themed. In the booklet included is a poster with an excerpt from the Creating The Mania book featuring a Q&A with Cedric Alexander. Once you open that you’ll see a poster of AJ Styles during a ladder match as each crate comes with a poster, much like the old WWE Magazines used to. Besides those two things the booklet shows you the upcoming Chris Jericho figure as well as what all comes in the crate. If you want to make sure you get the upcoming Chris Jericho Slam Stars figure as well as what else comes in the next crate be sure to order by February 15th as that’s the cut off date! Jericho completes the latest Slam Stars set and has the final ring piece to complete it. The link to that is above! For more wrestling figure news be sure to follow Wrestling Figure News on Twitter!